Rock climbing a steep face at Joshua Tree National Park. Reservations are required for all courses and guided climbs. To make a reservation, fill out our reservation form. For reservations with more than one person, a separate form must be completed by each person. Payment for 100% of the course fee or guided climbing fee is required to make a reservation. To pay online with a credit card, you'll see a page with a PAY NOW button that appears after you fill out the reservation form page. You may also call our office at (800) 514-8785 to pay by credit card over the phone. Reservations are recommended at least 14 days in advance of the course or guided climbing date to guarantee availability. For reservations less than 14 days in advance, please call our office to guarantee availability. When we receive your completed reservation form and payment, we'll email you a confirmation with all the details on what to bring, the time and meeting place of your class or guided climb, a map with directions to our meeting spot, and information on camping and motel reservations. You will need to provide your own transportation to the climbing area, although we will assist you with carpool information if you so request. Classes generally meet at 8 AM and generally last until approximately 4 PM. Weekend classes usually fill up 2 to 3 weeks in advance. Register early to avoid disappointment. You will receive a full refund (or you can reschedule) if we are forced to cancel your class or guided climb due to circumstances beyond our control, such as inclement weather. We will refund your payment in full (less a $25 cancellation/rescheduling fee per person) if you cancel or reschedule at least 10 days in advance of your scheduled date. Cancellations with less than ten days notice receive no refund, although you can reschedule with a 50% refund. Participants who do not show up forfeit their course fee. Many clients ask us if it is appropriate to tip their guide. Absolutely! As you will see your guide will be working very hard to provide you an enjoyable climbing experience. If you feel they did a good job, please feel free to tip your guide. We offer group discounts for our rock climbing classes, and we can provide all necessary rock climbing gear. You can use your own rock climbing equipment if you have it, or we can supply you with all necessary rock climbing equipment, including harness and helmet, at no extra charge. Rock climbing shoes are mandatory, and are available on a rental basis at $5 per day. 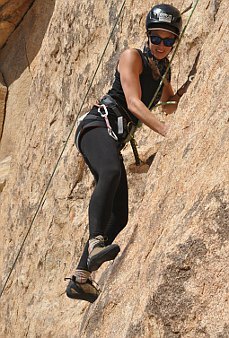 For Joshua Tree rock climbing classes, wear closed-toe shoes (no flip flops or sandals) for hiking and scrambling to the rock climbing formations. Wear shorts, tights, or loose fitting pants. Bring your lunch, plenty of water (at least two liters per day and three liters per day during warm weather), sunscreen, lip balm, sunglasses, perhaps a hat, extra clothing in case of cold weather (see winter clothing guidelines below), and a pack to carry all your gear. There is no food, water, gasoline, or cell phone service available once inside Joshua Tree National Park. During the summer season, our Idyllwild rock climbing classes and guided climbs are in a mountain environment at an elevation of 7,000 to 8,000 feet, and require a hike of about one mile over very steep, rocky terrain, so you must be in excellent physical condition to participate in our Idyllwild rock climbing classes or guided rock climbs. Lightweight hiking boots or climbing approach shoes are recommended. Afternoon thunderstorms are a possibility in these mountains during the summer season, particularly in July and August, so pack a rain jacket just in case. Joshua Tree is one of the only areas in the country that allows rock climbing activity throughout the winter season. From November through March, typical daytime temperatures range from the mid 40's to mid 60's. Dressing properly and preparing for cooler temperatures will allow you to have a more enjoyable and comfortable rock climbing class or guided rock climbing experience, even in cooler conditions. A layering system works best. Avoid cotton sweats, jeans, and any cotton clothing. When you sweat, the cotton will stay wet, unlike synthetic clothing that wicks the moisture away from your body. Start with long underwear (tops and bottoms) for your first layer (Patagonia Capilene works great). For your second layer wear polyester/nylon pants or tights, any type of loose fitting pants or stretch pants, and a fleece jacket or wool sweater. For an outer layer wear a windbreaker or windproof jacket. A down jacket, ski hat, and gloves or mittens are nice to have for cold mornings and evenings. If there is a chance of inclement weather during your class, bring a waterproof rain jacket that can serve as your outer layer. 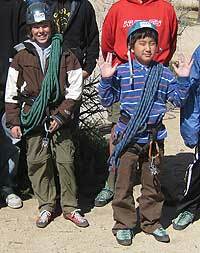 Dress properly and you'll enjoy your rock climbing class or guided rock climb even in cool conditions. Please contact us if you have any questions about what the weather should be like or if we can be of any assistance in helping you plan what to bring or wear. A day of guided rock climbing or one of our rock climbing classes makes a great gift! You can purchase a gift certificate for any amount with a credit card by calling our office at (800) 514-8785.